Driving on the East Brunswick portion of Route 18 isn’t always a picnic, what with its high volume and stress-inducing light-to-light starts and stops. However, there are many reasons to do so as there are a number of quality shops and establishments, including NJBIA member Eighteen Lumber, Inc., a family-owned business founded in 1965 by John Dobrzynski Sr. Eighteen Lumber features the most complete selection of lumber, millwork, and related building materials at one location in the Northeast. From the start, John was joined by his son Joe and their cousin Ed, along with a number of other friends and family members, with the goal of “providing the community with excellent customer service with a quality product for a reasonable price.” In 1968, John’s oldest son, John, Jr., joined the business and they implemented a prompt, free delivery system for local customers. Eighteen Lumber owner John Dobrzynski Jr.
Fast forward to 1985 when John Sr. passed away, but not before John Jr. brought his sons, Jack and Mark, into the business, and Joe added Todd, his stepson. In 2007, Joe retired after 42 years but the store is still in great hands with family members and dedicated employees. Eighteen Lumber offers a great variety of lumber products and hardware, which includes doors (interior, exterior and commercial); door hardware (both commercial and residential); decks (composite and wood); mouldings (interior and exterior); railing (PVC); exterior balustrade and columns. In addition, they also offer paint and stains; siding and shudders; adhesives; as well as tools, fasteners, nails, screws, drill bits and blades. What makes Eighteen Lumber such a long-term success, now at over 50 years? Putting customers first. A business doesn’t last this long unless it truly cares about its customers, which in turn produces tremendous positive word-of-mouth, and that is simply the best marketing plan any company can have. That commitment to the customer started with John Dobrzynski Sr. and still clearly resonates today. Personnel: Most of their employees have been with them for many years, which is often not the case with chain stores where turnover is more common. As such, they are well-trained and knowledgeable and work well together as a team. Free, Timely Delivery: Their commitment to free, on-time delivery is important and made possible with their fleet of vehicles including Boom, Box and Flatbed trucks. Supplier/Distributor Relationships: Great relationships earned over many years. Finally, while driving on Rt. 18 isn’t a picnic, you can stop by Eighteen Lumber and pick up the lumber and tools you need and build your own picnic table, which may be something that brings you and your family enjoyment and can serve as a stress-reducer. Congratulations to Eighteen Lumber for their long-term success and you can learn more about them at their website or Facebook page. 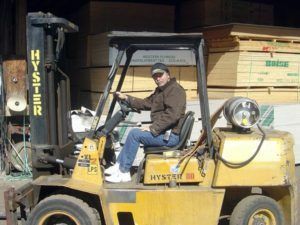 Eighteen Lumber is just one of 20,000 companies that comprise NJBIA’s membership, which is very diverse with representation from an amazingly large and wide spectrum of fields, industries and professions. Look for more unique stories about NJBIA members in future issues of “Beyond 10 West Lafayette,” NJBIA’s membership blog.